4" Drilled Rod-3/4"diameter Single Drilled. Clear Acrylic. Build a variety of displays that can be shipped flat and assembled by your customer with these drilled and tapped rods. 8-32 flathead screws included for each rod. Custom sizes available upon request. 6" Drilled Rod-3/4"diameter Single Drilled. Clear Acrylic. Build a variety of displays that can be shipped flat and assembled by your customer with these drilled and tapped rods. 8-32 flathead screws included for each rod. Custom sizes available upon request. 8" Drilled Rod-3/4"diameter Single Drilled. Clear Acrylic. Build a variety of displays that can be shipped flat and assembled by your customer with these drilled and tapped rods. 8-32 flathead screws included for each rod. Custom sizes available upon request. 10" Drilled Rod-3/4"diameter Single Drilled. Clear Acrylic. Build a variety of displays that can be shipped flat and assembled by your customer with these drilled and tapped rods. 8-32 flathead screws included for each rod. Custom sizes available upon request. 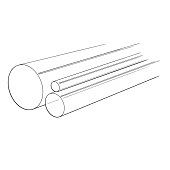 12" Drilled Rod-3/4"diameter Single Drilled. Clear Acrylic. Build a variety of displays that can be shipped flat and assembled by your customer with these drilled and tapped rods. 8-32 flathead screws included for each rod. Custom sizes available upon request. 4" Drilled Rod-3/4"diameter DOUBLE Drilled. Clear Acrylic. Build a variety of displays that can be shipped flat and assembled by your customer with these drilled and tapped rods. 8-32 flathead screws included for each rod. Custom sizes available upon request. 6" Drilled Rod-3/4"diameter DOUBLE Drilled. Clear Acrylic. Build a variety of displays that can be shipped flat and assembled by your customer with these drilled and tapped rods. 8-32 flathead screws included for each rod. Custom sizes available upon request. 8" Drilled Rod-3/4"diameter DOUBLE Drilled. Clear Acrylic. Build a variety of displays that can be shipped flat and assembled by your customer with these drilled and tapped rods. 8-32 flathead screws included for each rod. Custom sizes available upon request. 10" Drilled Rod-3/4"diameter DOUBLE Drilled. Clear Acrylic. Build a variety of displays that can be shipped flat and assembled by your customer with these drilled and tapped rods. 8-32 flathead screws included for each rod. Custom sizes available upon request. 12" Drilled Rod-3/4"diameter DOUBLE Drilled. Clear Acrylic. Build a variety of displays that can be shipped flat and assembled by your customer with these drilled and tapped rods. 8-32 flathead screws included for each rod. Custom sizes available upon request.